Those who need a wealth of customization options from their web browser, which are not usually included in popular alternatives like Google Chrome, Firefox and Internet Explorer can definitely rely on Sleipnir. 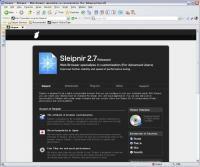 Sleipnir lets you opt between Internet Explorer’s Trident or the Webkit rendering engine, with the possibility to customize the rendering engine for each website you access. You can change Sleipnir both functionally and visually, thus it is possible to customize the page search bar, address bar, bookmarks panel and the UI. Also, you can significantly expand the browser’s functionality using any plugin or extension that is available for Chrome. Sleipnir also relies on Fenrir Pass, its own cloud service which syncs your bookmarks and browser data, provided you are willing to create a Fenrir Pass account. Once you do that, you will be able to share visited web pages with various web apps like Dropbox, Facebook, and Google+. The browser also provides smartphone apps for iOS and Android devices, which will sync to your user account via Fenrir Pass.